The octagonal tower (3.20 m. long on each side) stands on a base of three steps and is built of white Pentelic marble. It has a conical roof, a cylindrical annex on the south side, and two Corinthian porches, one on the NE and one on the NW side. At the top of each of the eight sides there is a relief representation of a wind, symbolized by a male figure with the appropriate attributes and its name inscribed on the stone. There were sundials on the external walls and an elaborate waterclock in the interior. The tower was built in the first half of the 1st century B.C. by the astronomer Andronicos, from Kyrrhos in Macedonia. 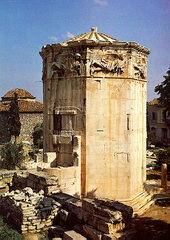 In the early Christian period, the Tower of the Winds was converted into a church or a baptesterion of an adjacent church, while the area outside the NE entrance was occupied by a Christian cemetery. In the 15th century A.D., Cyriacus of Ancona mentions the monument as the temple of Aeolos while an anonymous traveller refers to it as a church. In the 18th century it was used as the tekke of the Dervishes. The monument had been half-buried by the earth accumulated over the centuries. It was excavated between 1837 and 1845 by the Greek Archaeological Society. Restoration work was carried out in 1916-19 by An. Orlandos and again in 1976 by the 1st Ephorate of Antiquities.